Amazon.com Price: $5.99 (as of 2019-04-25 14:40:38 GMT) Product prices and availability are accurate as of the date/time indicated and are subject to change. Any price and availability information displayed on Amazon.com at the time of purchase will apply to the purchase of this product. One of the greatest love stories of all time, Pride & Prejudice, comes to the screen in a glorious new adaptation starring Keira Knightley. 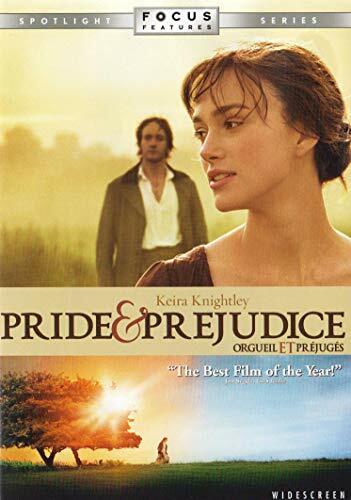 When Elizabeth Bennett (Knightley) meets the handsome Mr. Darcy (Matthew MacFadyen), she believes he is the last man on earth she could ever marry. But as their lives become intertwined in an unexpected adventure, she finds herself captivated by the very person she swore to loathe for all eternity. Based on the beloved masterpiece by Jane Austen, it is the classic tale of love and misunderstanding that sparkles with romance, wit and emotional force. Critics are calling it “Exhilarating. A joy from start to finish” (Carina Chocano, Los Angeles Times). Save On Your Disney Vacation: $.99 Kids Meals at Rainforest Cafe!